KAMPALA- The attorney general (AG) Thursday failed to grill former FDC president Dr. Kizza Besigye in a case in which he dragged Civil Aviation Authority (CAA) to court over his arrest at Entebbe airport by security operatives in 2016. The AG’s representative, Mr Geoffrey Atwine told court that he was not ready to proceed with the cross-examination of Besigye who was present in court saying that he had just been served with his( Besigye) witness statement thus seeking for more time to internalise it and also consult his client the Uganda police. Court also heard that from the CAA lawyer, Mathew Ngugo the CAA that they do not intend to cross-examine Besigye but shall address all issues he raised through their client the police and later make submissions. Through his lawyers of Rwakafuuzi & Co. Advocates, Besigye sued CAA over arresting and pulling him out of the Kenya Airways plane which he says contravened his right to free movement as a Ugandan citizen. In support of his suit, Besigye in his sworn-in affidavit before the court says that on August 22, he left Uganda and addressed conferences in London, Geneva, and Boston and returned on October 3 using Kenya Airways aircraft which landed at Entebbe. He states that on October 3, 2016, he was pulled off a Kenya Airways plane by security who connived with CAA officials and that he was driven against his will through remote routes from Entebbe airport to his home in Kasangati. He further states that he was denied the right to meet and move from the airport in the company of his waiting family, friends, associates, and supporters, hence violating his freedom of association. He narrates that on that day he noticed that the plane had parked unusually far from the terminal and when he got out, he suspiciously noticed a bigger presence of CAA staff on the tarmac and a CAA vehicle driving closer to the aircraft. 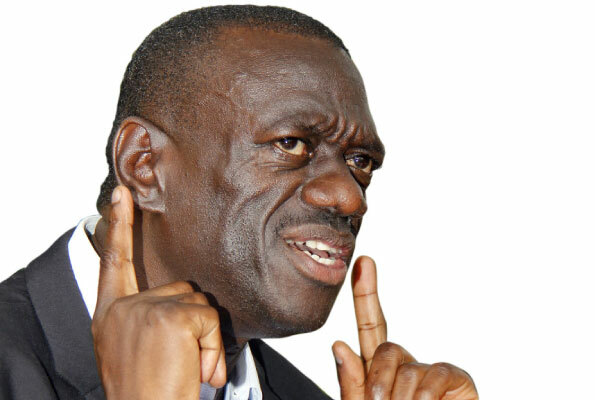 “Before I could disembark from the staircase, a staff of CAA wearing a reflector jacket pulled me from the last step of the staircase and grabbed me by my trouser towards the CAA vehicle which drove me away before I could even go through immigration procedures at the airport,” Besigye narrates in his witness statemate. The trial judge Musa Ssekaana has adjourned the matter to October 26 with orders that all parties produce all their witnesses.